Online training in gut health and colic prevention has prompted several Canadian trainers to change their horse management methods. Myths were dispelled about colic in horses and the intricate workings of the equine digestive system revealed during the Gut Health and Colic Prevention course, which took place online over a three-week period earlier this year. With colic being the number one killer of horses, other than old age, many of those taking part said they planned to alter their feed programs in a way that will reduce colic risks. Others were surprised to learn that about 80% of colic episodes may be related to management and therefore can be prevented. The program is an online training partnership between Ontario Racing and Equine Guelph, with funding provided by Grand River Agricultural Society. An interesting topic raised was that of research bringing new insights about the gut microbiome. We have known that horses are hind gut fermenters but now we are learning more and more how to feed the “bugs” in the gut to promote a healthy gut. Understanding of both the horse and human gut are growing as researchers are linking disturbances of overall health with imbalances in the gut microbiome. A discussion forum associated with the course had more than 650 posts, and guest speaker and equine nutritionist Don Kapper was on hand dispelling myths and discussing nutrition as it pertains to horse health Iand performance. Students learned that athletic horses in the racing and non-racing industry are often exposed to more stressors and factors that can contribute to gastrointestinal issues. Other risk factors such as the amount of forage fed, turn out time and dehydration and electrolyte status were major topics of discussion. It can be difficult to maintain desired body condition in intensely training racehorses. You are not only dealing with the physical conditioning of the horse, but you are dealing with the mental conditioning as well. It seems the higher strung they are the more difficult it is to keep them on feed and performing. 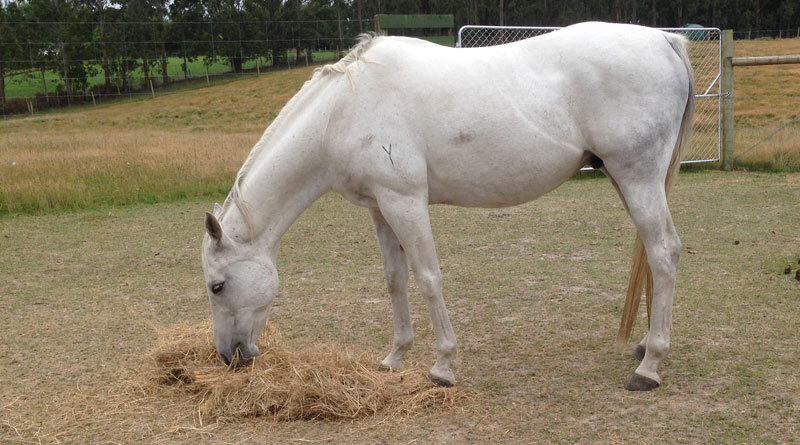 Intensely trained horses can eat up to 3% of their ‘ideal’ body weight per day in hay plus horse feed. If we don’t know how much hay the horses are eating, we recommend not feeding over 40% of their estimated Total Diet as horse feed. So if we have a 500kg horse, eating 3% of their body weight per day, that would be 15kg/day. 40% of that would be 6kg/day of horse feed and 9kg/day of hay. So as you approach this maximum amount of performance feed per day, begin adding your selected vegetable oil. Don’t wait until they go off feed and then try to get them to eat more of the performance feed. Assuming the hay contains 2% fat and your performance feed contains 6% fat, that would equal .36kg of oil from the grain mixture and .18kg of oil from the hay, totaling .54kg of ‘added’ oil per day. The maximum amount of oil a 500kg horse can ’emulsify’ per day is .68kg per day, so you can add up to a ‘maximum’ of .14kg of your liquid oil per day, or 0.7kg of Rice Bran. Start adding it slowly and increase the amount fed per day to appetite and/or desired body weight. Another ‘observance’ you need to make: When forages are fermented in the hindgut of the horse, there are two by-products, Gas and Heat. Therefore, in the Winter it is easier to keep the horses ‘on feed’, because they will be interested in eating more hay to stay warm. But in the Summer, when the ambient temperature increases, the horse will back off eating hay due to the internal heat production in their hindgut. That is when it is easy to ‘over-feed’ your grain or grain mixture. If you go over 50% of their diet as grain or grain mixture, you will send them into ‘acid gut syndrome’, causing them to stop eating, loosen stools, and if it leads to diarrhea it is due to ‘acidosis’, that can lead to laminitis. When the stools loosen, you know the fermentation vat is not functioning optimally. This prevents the horse from breaking down the forage and absorbing the nutrients found inside the plant. This also means that the B-Complex vitamins are not being produced and an inadequate amount is being absorbed to help the performance horse use the other nutrients, like calories, being fed. This is why B-Complex injections or supplements are so common at racetracks and why trainers say they help the horses perform. If the gut was functioning optimally, they would see no change after supplementing the B-Complex vitamins. It is too common to have the horses ready to race, only to have them go ‘off feed’, and have to scratch them from the race. Remember also to use a performance electrolyte after training and racing. It will make a world of difference after losing 40lbs during a race. Mix 4 oz per liter of water and offer it to the horses as they cool down. In the summer, when they lose so much weight, they would be expected to drink up to 3 liters after a race. That is a normal amount and you will be impressed with how well they will respond. • A further course is planned for 2019, but in the meantime, Equine Guelph’s interactive Colic Risk Rater healthcare tool is always available.